The T-62 is a rank VI Russian medium tank with a battle rating of 8.3 (AB/RB/SB). In the 1950s, with the introduction of the 105 mm L7 tank gun on many NATO tanks such as the Centurion, Leopard, and M60, the Soviets realised that the 100 mm D-10 on the T-54/T-55 series of medium tanks was becoming obsolete. To maintain parity with the new NATO tanks, a new 115 mm smoothbore gun was developed along with a new medium tank based on the T-55. This tank entered service in 1961 as the T-62 and was the first tank in the world to begin service with a smoothbore gun. 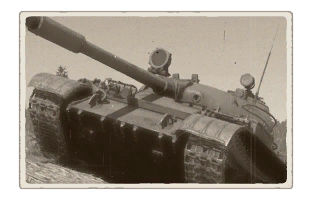 As in real life, the T-62 is the first Soviet tank in the tech tree to be equipped with a smoothbore gun and is also the first Soviet medium tank in the tech tree capable of firing APFSDS rounds. While there is little improvement in terms of mobility or protection over the previous T-54, the T-62 has substantially improved firepower. It is capable of frontally penetrating nearly any tank it is likely to see in-game at most combat ranges. It is also the first Soviet medium tank to have a gun stabiliser, allowing it to fire on the move with reasonable accuracy. The armour protection of the T-62 is very similar to that of the T-54. Unfortunately, the T-62 tends to face more powerful guns at its BR, so its armour is not nearly as effective for its BR as the T-54's is. The well-rounded turret and sloped hull can ricochet poorly aimed rounds when angled, but should not be relied upon to protect the T-62. Like most Soviet tanks, the T-62 has a very compact layout, meaning that a single penetrating hit is will most likely cripple or outright destroy the tank. Of particular note of concern is the front hull ammunition rack inside the fuel tank situated next to the driver. This rack is the ready rack of the T-62 and cannot be emptied by reducing the number of rounds carried. A penetrating hit there is likely to result in an ammunition cook-off that will instantly destroy the tank. The T-62's mobility is somewhat similar to that of the T-54 medium tank, although the heavier weight makes it a little bit more sluggish. It can reach a respectable 50 km/h forward, and the maximum reverse speed is 8 km/h. Because the T-62 is longer than the T-54 and does not have neutral steering, its turning performance is noticeably worse, especially on rough terrain. The 115 mm 2A20 smoothbore gun is a potent gun capable of firing APFSDS, HE-FS, and HEAT-FS ammunition. It is stabilised, allowing for accurate firing on the move. The turret traverse is also significantly improved over that of the T-54, and the turret also provides more gun depression, allowing for some use of hull-down tactics. It should be noted that the gun has limited depression when the gun passes over the hull fuel tanks (at roughly 45 degrees to each side). Due to the large size of the 115 mm ammunition and cramped space of the T-62, the reload is much slower than that of comparable NATO tanks (~10–12 s depending on crew skill level and training). While the APFSDS ammunition is not as lethal as the APHE ammunition used on previous Soviet medium tanks and requires some degree of careful aim, it is still capable of one-shotting tanks, especially with frontal penetrations. There are two types of APFSDS ammunition: 3BM3 and 3BM4. The stock 3BM4 round has a pure steel rod penetrator while the unlockable 3BM3 penetrator is a steel rod with a tungsten slug inside the penetrator. The latter has substantially more vertical penetration and somewhat better post-penetration lethality, but its performance against highly sloped armour is significantly worse. Both rounds have outstanding muzzle velocities of over 1,600 m/s, allowing long-range shots to be made without much lead. The 3BK4 fin-stabilised HEAT round has more penetration than either APFSDS round and retains its penetration at long ranges, but has a much slower muzzle velocity that makes aiming at long ranges significantly more difficult. It is more effective than APFSDS against lightly armoured targets since it can reliably hull-break them if it detonates. The 3UOF11 fin-stabilised HE round is rather unremarkable and is only really useful against soft targets. Summarize and briefly evaluate the vehicle in terms of its characteristics and combat effectiveness. Mark its pros and cons in a bulleted list. Do not use more than 6 points for each of the characteristics. Avoid using categorical definitions such as "bad", "good" and the like - they have a substitution in the form of softer "inadequate", "effective".